Providing High-Quality Commercial Appliance Maintenance and Repair in Pleasant Hill, Concord, Danville, Walnut Creek, and West San Francisco. Welcome to WEPCO Appliance Professionals commercial appliance repair and maintenance service company. At WEPCO, we are a family-based appliance repair company, offering quality services to commercial business in Pleasant Hill, Concord, Danville, Walnut Creek, and West San Francisco for more than 20 years. We are available for routine commercial appliance maintenance or assistance with installation and replacement. Additionally, we are available for routine or emergency commercial appliance repair, including 24-hour on-call service. There is no job too big or too small for our expert appliance repair technicians to handle quickly and efficiently! We provide routine maintenance for public water fountains as well as repairs for problem fountains. We service Elkay Manufacturing and Halsey Taylor fountains. Whether there is a leak, a coolant problem, or a faulty part, our appliance professionals are equipped to diagnose and treat all indoor and outdoor water fountain repair needs. Refrigerated water chillers are convenient, but can cause many problems when they malfunction. Our service technicians are EPA certified and qualified to repair Elkay Manufacturing and Halsey Taylor water chillers. Whether you run a hotel, a laundry mat, or a hospital, we can repair and replace washer and dryer parts for all styles of residential and commercial washers and dryers, on location. Whether in an industrial kitchen, or small kitchenettes, WEPCO Appliance professionals can maintain, repair, or replace your residential, commercial, or industrial cooking elements. We service both electric and gas ovens, ranges, and cooktops. We take pride in being EPA certified for refrigeration repair. Our appliance repair technicians can repair or replace any style of residential, commercial, or industrial refrigerators, including sealed system refrigeration and walk-in refrigerators and freezers. We do not subcontract; if you hire us, you will work directly with a licensed and insured WEPCO Service, Inc appliance professional. We offer a 1-year buy-back warranty on all parts and a 90-day labor warranty for all services. We are proud to boast an A+ Better Business Bureau rating for years because we offer honest, quality service to every customer as if they are our only customer! We conduct routine appliance maintenance and preventative services in addition to appliance repair. We have been serving commercial business in the greater San Francisco Bay area for decades and are confident we can provide quality service to your business. 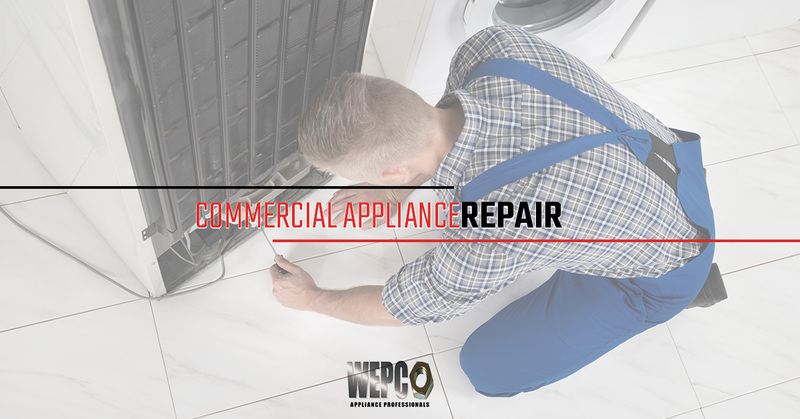 For all of your commercial appliance repair needs, contact WEPCO Appliance Professionals today!